When reviewing a new speaker system, we like to get right to the chase. 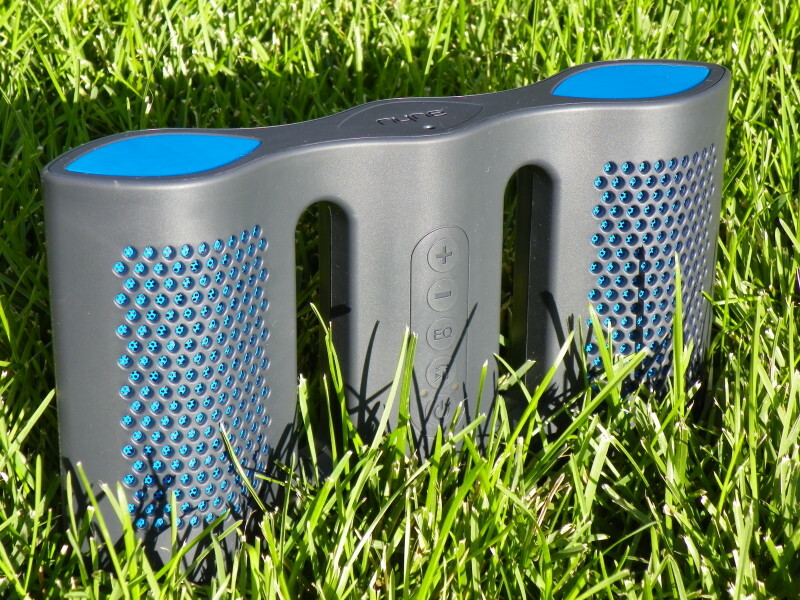 Yes, we do like the Nyne Aqua Portable Bluetooth Speaker… and now here’s the rest of the story. Nyne took on a big task when they sat down to design the Aqua. For every ounce of rigidity and waterproofing you add to a speaker, you are potentially changing the overall sound. It is like having a swimsuit competition, where the contestants must also be able to withstand a sandblasting. And this is what really impressed us about the Nyne Aqua. It is advertised as IPX-7 certified, which means that you can not only splash a little water on it, but you can also dunk it in 3 feet of water for up to 30 minutes. ‘But you can’t hear anything when it’s completely submerged in water,’ you say. Yes, and this is why the most important thing about that is that you don’t ever have to worry about it getting damp, splashed or caught in a full-on downpour. The Aqua also floats, which allows you the option to float the speaker in water while you’re listening. Just keep in mind that if there is a typhoon or excess splashing and the grill gets filled up with too many water droplets, it will eventually affect the sound quality. But no worries, as a few quick shakes will return the sound to normal. The Aqua comes with a rugged rubber housing that is sturdy and light. While many Bluetooth speakers need to be handled like a glass egg, the Aqua is not particularly temperamental. It is put together very tight with no knobs or switches. In other words, it is not fragile and even when you give it a good smack with your hand, it just makes a nice hollow thud. It is also very easy to carry around with its dimensions of only 9.5” X 5” X 2”. 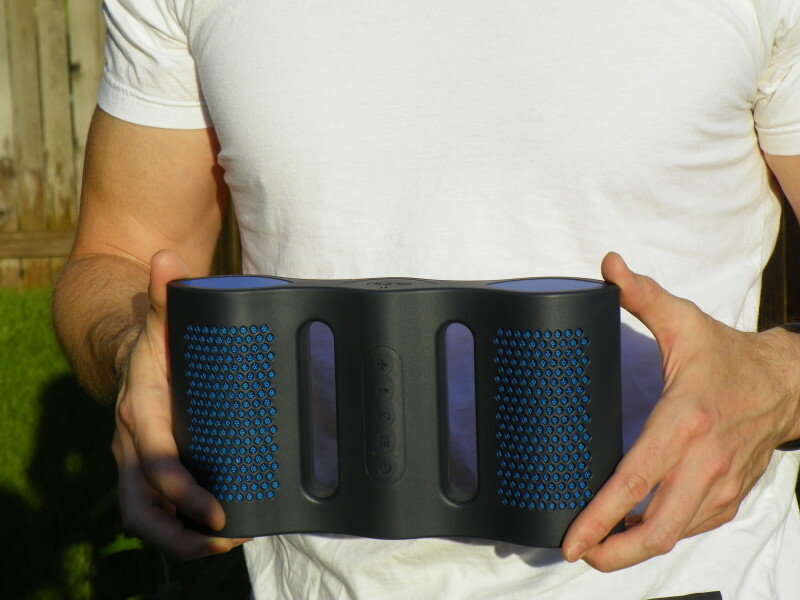 And with its ‘hull’ shape, it is easy to carry which is perfect for a speaker designed to be ‘on the go’. Its Bluetooth 3.0 paired up quick with every device we threw at it and proved to be capable of working for up to 30 feet or more. And it does seem to handle itself well through walls, which is something that we have trouble with when working with other Bluetooth speakers. Considering its waterproof nature, we also loved the Aqua’s ability to take calls through its multi-function button. Its built-in microphone worked great at long distances, with the idea being that you can take a call in the pool or bathtub without ever putting your phone in danger. Its battery life is rated at 10 hours at moderate volume, and even close to max it seems to last a good 6 to 8 hours. To charge it back up was also a relatively quick affair at somewhere between 2 to 6 hours, depending on the state it was left in before the charge. Okay, so it is rugged, sealed for water immersion and takes your calls without any fuss… but how does it sound? Well, considering the layer of waterproofing over each speaker, the Aqua sounds amazing. The sound quality is clear and the bass is tight and undistorted even at close to max volume. However, it does tend to favor bass more than treble, but with its built-in choice of equalizer settings – you do have options to adjust it a bit. You have four options, as a matter of fact, including neutral, rock, pop and jazz. The aqua also comes in two colors (grey/blue, white/blue), slick red cables, a silicone strap to hang it and an enclosed 3.5mm AUX input. Yeah, we like it… and you can get more information on Nyne’s website here or pony up to Amazon and buy one now .